What was the solution? I had the same problem but mini was out of warranty so I replaced it with dc180 which is dead silent. My mini 180 works but is relatively noisy. Loosening the screws helped, but it was still to loud for me. Mine just has a vibration to it that I cannot get rid off. I do not think the noise level would bother some people, but for me it is to loud. It is collecting dust in my basement. I am having trouble with my dc 150 pump. It's kicking a sound in every or 2 seconds. It's much like start and stop in every second and pump is surging. I tried to take it from skimmer body and completely disamble it. No cracking on impeller teeth or scratches on impeller. I tried it working alone without skimmer body. No luck. Any advice? I also tried to take a video but cant hear this sound in video. Is it actually starting and stopping or is it just making a sound? How many turns out on the nozzle do you have it from fully closed? What is the sump depth? How old is the skimmer and when was the last time you took it fully apart for a thorough cleaning? I’d take it complete apart. Do a thorough cleaning per the instructions in this thread. Make sure you inspect the venturi port on the nozzle for salt creep. If I had to guess, I’d suspect it could either be the pump needing cleaning or that you need to open the nozzle more as that will cause surging and can make a bit of noise if the pumps not getting enough air. Follow the cleaning instructions in this thread and be sure to clean the bearing as per post #2. Last edited by slief; 08/03/2018 at 04:16 PM. It's running in 9 inches depth but it tried it in lower inches also without skimmer body, same results. I think it's not making start and stop just making crackling noise. I cleaned it 8 months ago, but when I checked tonight the pump was clean enough. Skimmer is 3 or 4 years old. The pump should be cleaned every 4-5 months. Calcium buildup inside the magnet cavity and bearing will create friction on the bearing and can cause the motor to temporarily go into protect mode and stop itself. Prolonged start/stops will cause premature failure. Take a look at this thread and also read my edited post above because I revised my post at the same time you replied. A complete break down of the pump for proper cleaning is critical. If when you tested the pump, you still had the airline connected, you may need to open the nozzle up more too as I noted in my edited comment above. Again, take a look at this thread. Post 1 and 2 apply..
Running a BK DC150 on a Red Sea Reefer 250 with a Triton34 sump. This is a used skimmer so broke in before I got it obviously. With that being said I ran it for 3 full days in the sump without the skimme cup on. 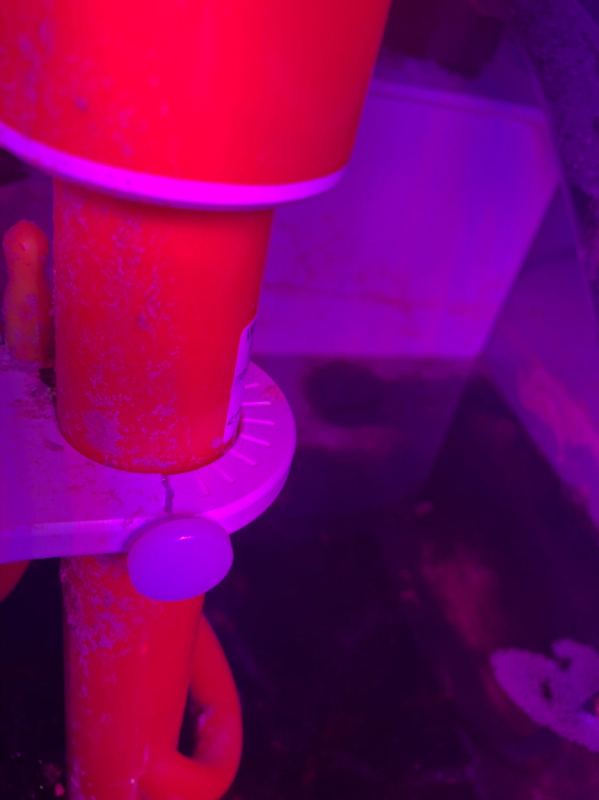 Now that I have the cup on, regardless of what setting I choose it just fills the cup, so I removed the plug so it just falls back into the sump. Ruining in 7.5” of water with the tube full open, I’ve done 1 turn, 2, 3, 4, and 5 and it’s just overflowing regardless. You may need to go further out on the nozzle than 5 turns. Open the nozzle until the overflowing subsides. The “ideal” setting really depends on the amount of dissolved organics in the system. The more organics in the system, the more the nozzle will need to be opened. Also, it may not hurt to raise the skimmer up a half inch or so or lower the sump level a bit as that too will reduce the tendency to overflow and help you dial it in. Especially if there are more dissolved organics in the system than you realize. And despite it being used previously, if the skimmer was dry when you got it or cleaned, it will need to break back in which can take a week or so. Also, make sure there isn’t any salt build up in the nozzle where the hose connects to the pump. That is a point that is often overlooked. Any salt buildup in there (which is common) will increase the water flow into the skimmer and decrease the air intake causing the skimmer to overflow. Also, if the skimmer was used and the pump wasn’t broken completely down and cleaned inside and out, that would be advisable because stuff in the needle wheel will also increase the water flow and decrease the air intake causing the water level inside the skimmer to run higher than it should. That did it. Kept at 4 turns and raised it 1/2” and bingo. Once the tank has evaporated a little water I can use the built in water level control in the sump and remove the egg crate. BK Double Cone 200 with fix speed motor, bought brand new 6 months ago. Mainly LPS acans and 2 monti cap, Some small acro colony and frags of digitata etc. Anyway I see my skimmer is not working effective as before and thought this can be the reason of high NO3 .Did good cleaning 5 days ago but still not perfectly dialed in.I am running it normaly 25cm water level,water exit setting is mostly close to full open and 2 turns open venturi but bubbles reach top of collection cup and skimmer overflowing in 6-8 hours which is changing my salinity due to the ATO also. You hardly have much of a fish load for that skimmer so you will need to run it wet to keep it consistent. I think lowering the sump will will help prevent overflows. Don’t expect much skimmate with 12 fish. Open the nozzle more might help with overflows as it should increase air flow into the skimmer while decreasing water flow. The food will kill the foam head and make it drop due to oils in the food and changes in surface tension of the water. That is normal. According to your answer I understand feeding time is not a good reference to make some settings on skimmer I should wait effect of feeding in skimmer gone and then do settings? Also last question is about cleaning BK CONE 200 I was using teeth brush to swipe collection cup inside and out. I was not sure what part was called neck, but I see it is the inside of the collection cup. Should I continue this as well without touching it with my finger I know the effect of fats etc. what about the body of the skimmer, I should not touch it till I do complete cleaning in 3-4 months depending on conditions of dutrients of course? The neck is the vertical part foam rises up into the cup. You want dense foam in there. You don’t want wet bubbles overflowing into the cup. DOC’s will eventually be pushed to the top of the foam and make their way into the cup. With the nozzle completely screwed in is less air & more water. Open is more air air & less water. You need to play with That adjustment to find the sweet spot. I recommend using gloves so the oil’s in your skin don’t impact the skimmer when you make adjustments. That way you can see the difference it makes it quicker. Make small adjustments on the nozzle and take notes if you need to. When you feed it is going to impact the skimmer so don’t make adjustments around feeding time. You can take a couple hours for things to settle back down after feeding. I would recommend cleaning your collection cup every two weeks. You can just take the entire cup off and clean it off in the sink. It will take a day or so for things to go back to normal after cleaning the collection cup. Hi I have SM 200 been running for almost 24 hours and today in the morning I couldn’t see inside the collection cup there is a lot of condensation inside never seen this before I think I am doing something wrong, thanks for your help. The condensation is likely the result of you having the skimmer running really wet. That said, it takes a week for the skimmer to fully break in and until that time, the foam head may not be fully settled. After only 24 hours, the skimmer is nowhere near broken in. If this is one with the RD3 pump, I would suggest running the pump between 28 and 32 watts. That is a general range for the sweet spot on that skimmer. Too high of a pump speed will result in less contact time and fast moving bubbles that burst at the surface and this too will result in a lot of water condensation in the cup. Use the pump speed to get the most dense foam you can which like I said should be between 28 and 32 watts Also set the line where bubbles turn to foam (break line as shown in the manual) to just below the collection cup while it breaks in. That will be the dry skim setting. Use the wedge pipe to fine tune between dry and wet. As you close the wedge pipe. the break line will rise up making for a wetter skim. Also, if your tank is new and you don't have a decent fish load, don't expect much skimmate. You need dissolved organics to generate good consistent dark skimmate. Thanks Sylef i lower it to 32 will leave there see what happens and also adjusted bubble heigh. Glad to help. Sometimes less is more. Be sure to test it a bit lower speeds too. You might be pleasantly surprised. Every tank is different and that same pump is used for the 180, 200 and 250 sized skimmers so it’s very versatile but different sized skimmers require different flow rates and different loads impact the “ideal” setting for any skimmer size. The good thing is that the RD3 50 allows your skimmer to be highly tunable due to the RD3’s very fine incremental speed settings. As such, play with it a bit and find the setting that gets you the most dense foam for your load. You should find that to be between 28 and 32 watts but it could even be a bit less. You want slow rising thick foam in the neck of the skimmer. Also keep in mind that the dissolved organics in the water is what allows the bubbles to stick together to create foam. In the absence of enough fish, you won’t have much in the way of dissolved organics and that can impact the skimmers ability to make consistently thick foam and it will also impact the amount of skimmate your skimmer produces. Have had my DC150 setup for a year and just can’t seem to get it tuned to how I like it. Either it’s producing almost no skimmate and it’s all ending up inside the neck, or I adjust stand pipe a little bit and it skims too wet. I’ve been screwing In The volute a little bit each day to try to get some better results. I also broke the plastic that houses the screw for the standpipe by screwing it in a bit too much, is that replaceable? That screw is an M6 x 16. You can source a nylon M6 screw online easily my searching M6 nylon screw. Any M6 screw that is over 16mm long will work. I checked our site and don’t see them in the US store but that’s likely because you are one of the first I’ve seen that broke his in the last few years. There really is no reason to tighten much at all either. In fact, on my Supermarin, I never even tightened it other than to have a slight amount of friction on the wedge. That said, you are on the right track as far as turning the nozzle a little bit at a time to find the sweet spot and once you have it close, a fraction of a turn on the nozzle as well as a fraction of a turn of the wedge pipe can make a big difference so keep that in mind when you are turning the wedge. Just a tiny bit of a turn like a degree or less is all that’s needed. Also, not sure how many fish you have but the less the load, the harder it is to keep it consistent without spending the time to really fine tune the nozzle. To me it sounds like you are close if not spot on with the nozzle and just need to do finer adjustments of the wedge. And if you have a really low load, you can’t expect much skimmate in the cup and will see a bit more accumulation in the neck unless you are skimming fairly wet. My fish load is pretty decent, it’s a 80g display with abou 9 fish, and I feed heavily. Yikes.. That’s welded to the body and top flange so replacing it isn’t possible to replace and it’s not a part that we sell. Fixing it would be pretty easy though. What I would do is remove the wedge pipe, remove the screw, clean the crack with some rubbing alcohol and a tooth brush. Let it dry and then apply some PVC cement to the inside of the crack. If you use a syringe, you could get the cement in there without making a mess. Then clamp the crack closed and let it set for a day. That should weld that crack as that support is made from PVC. I’d get a 6mm tap as you are likely to get some glue into the threads and run the tap through the hole to clean the threads up. Make sure the PVC cement is fully cured before putting the screw or wedge back in place. Thanks! I will do that when I get some time, it does still have enough pressure to hold the pipe luckily. Hi all, which level of bubble separation i should put on my Bubble King Double Cone 200? Hey all, been Reading through the thread and cant really seem to apply the the setting provided on my BK SM200. I tried running the pump at 30w and having the wedge fully open. at 9" or roughly 23 cm. This puts the waterlevel within the body at around half way up to the skimmer neck. Closing the wedge to 1/2 puts the skimmate at around 1.5 inches below the neck. I've tried raising the waterlevel to 10" but dont seem to get the all the way up to the neck again. Gonna remove and clean the skimmer today so see if something is clogging it but i doubt it. I run it on a reefer 625XXL with a (according to me) high fishload. 22 fish and 3 of them tangs. I feed twice daily, primarly frozen. I also run a mechanical filter in the form of a clarisea SK5000.